Your word is your bond. Your word is you. If you do not keep your word, how can I trust you. How can I respect you when you do not keep your word? You should do what you say you will do. Can’t do it? Don’t say it! Otherwise, you leave me no choice but to see you less than what you are and even less in whom you say you are. Your word has no power, and no backing; it is nothing but air. You can’t even play truth, nor can you even take the dare. You’re blowing smoke in saying what you will— but even your will is at a standstill. 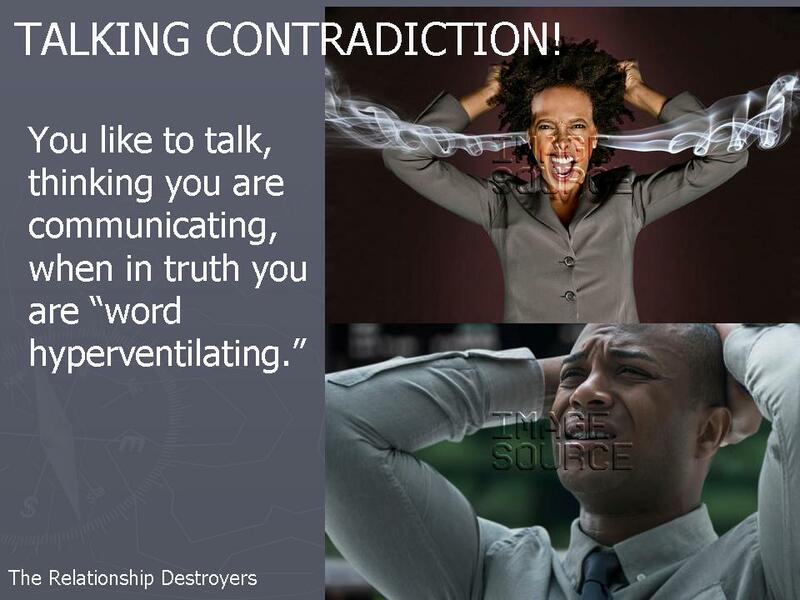 It has been so long since you have been “that real.” This makes you a talking contradiction. You talk out of your face, saying things to try to make me feel a certain way. But all I see is a fake play by play. If I strike you with the power of truth, you can’t handle it; you will just back away; because you are a talking contradiction. See you talk so much folk think you are rich, but you are really broke. When money is given to you on loan, your words cause you to choke. Despite what you say, you simply do not pay. When it comes to financially handling, you come up short. When it’s time to pay back, you just don’t. You talk like you have the power, but when in the presence of real power, you actually cower. You say what you want to do, but lack the chutzpah to actually do. You talk about a system, something you cannot control— so all you do is patrol, appearing to be in control, but when the chips are down, you are at a loss for the words and the action; because you are powerless to counteraction. You think you know what you know, when all you know is what you were told. When it comes to living what you are told, and being ’bout it, ‘bout it, — even you doubt it. You tell others what they should not say, and you demand respect. But when you get out of line, and are told the same, you punk up and just walk away. Even your indignant pride is not enough to make you stay; because you are a talking contradiction. See, all you’ve got are a bunch of words, because when I peep your game, your deeds, and your work— your verbal responsibilities you shirk. Now every time you speak, I see you, just as you are— weak. And you have the audacity to think you know me in some illusionary capacity? You are saying things, trying to infuriate me. Thinking I am powerless against the words you say, when in truth I am only letting you have your way. Should I try to reason with you? Nah! You don’t even get the time of day. So, I just let you have your say. Rather than choosing to talk it out, try to work it out. Keep your word, and fulfill it no matter what. Take a stand; be a woman! Be a man! You and your word are one. Let it be spoken, let it be done! This entry was posted in Dedication to Meditation and tagged anger, communicating, complement, dare, keeping it real, lying in the relationship, power, pride, respect, responsibilities, talk, trust, truth, value system, word is your bond, work. Bookmark the permalink. “Word up”!! Your word is definetly your bond! Your bond, is your restraints used to hold your words to fulfillment, and bring your works into consummation. This “poem” has such great pacing and the movement is very fluid. It seems to have hidden stanzas—but the poem doesn’t need stanzas because everything flows together so well as a whole. It urges the ideas of personal responsibility and self-awareness.